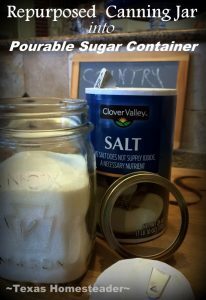 Repurposed Canning jar & Salt-Container Pour Spout Makes Pourable Sugar Jar! I make sun tea any time it’s sunshiny and even close to being warm – Summer – Fall – Winter or Spring! I have a large hourglass-shaped glass picante jar that I fill with water & drop in a tea bag. Then I place it on our picnic table in the back yard and the sun does the rest! By suppertime (or much earlier in the heat of summertime) our tea is deliciously brewed by the sun. I just bring it inside, mix it with a jar full of water and voila! Tea brewed with no purchased energy. Can’t get better than that, right? I made a cute sugar jar for sweetening our tea using a repurposed canning jar and an empty box of salt! C’mon, we live in the south – HOME of sweetened tea! Of course RancherMan likes to sweeten his tea, while I prefer mine unsweetened. Since we don’t both sweeten our tea I leave the brewed tea in the pitcher unsweetened and RancherMan sweetens his tea by the glass. But each time he wanted to sweeten his tea he had to pull out the bulky sugar canister from the cabinets and scoop a little sugar into his glass. I knew there was a better way. But you know my battle cry: Use Whatcha Got! Hummm… This could be really, REALLY easy! First I cut the top cardboard section from an empty canister of salt. Then I used a canning jar ring to mark the area I needed. Finally I cut the cardboard to a size that fit snugly inside the ring. 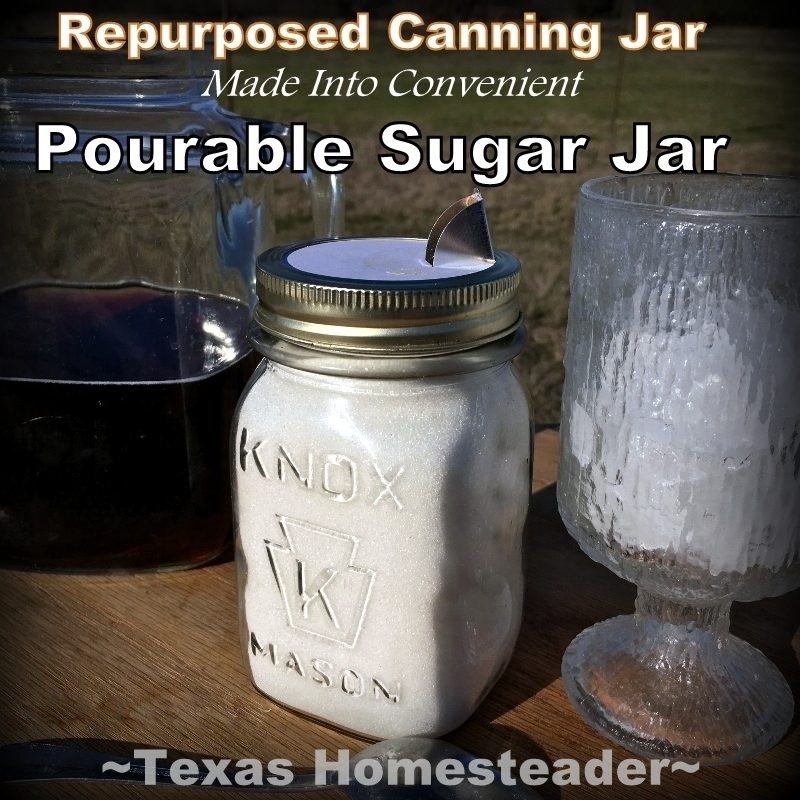 Then I inserted the cardboard cut-out containing that metal spout into my canning jar ring and screwed it back onto my pint canning jar of sugar. Since it’s a regular-sized ring it fits all regular canning jar mouth sizes whether 1/2 pint, pint or even quart! Now we have a smaller easy-pour sugar container. Plus the canning jar is perfectly themed with my kitchen. And since it’s pint-sized it’s easy to lift & pour, unlike the bulky sugar canister RancherMan was using. And, you know, the most beautiful part is that it only took MINUTES to complete! He’s very pleased with this repurpose and it cost nothing. Use Whatcha Got! This entry was posted in Blog Posts and tagged Environment, Frugality, Make-It-Yourself on February 15, 2017 by Texas Homesteader. That is brilliant! This would be great to take along on upcoming spring and summer picnics! What a great idea for sugar or salt! I like to sweeten iced tea with simple syrup, which I keep in a canning jar in the fridge. What we do without our canning jars?! How clever! I’ll have to remember to save the salt top the next time we run out. Thanks for sharing on the #WasteLessWednesday Blog Hop! What a perfect and simple idea – brilliant! I’m pinning to try later and I’d love if you’d come share this week for Awesome Life Friday. I have done the same thing with salt. 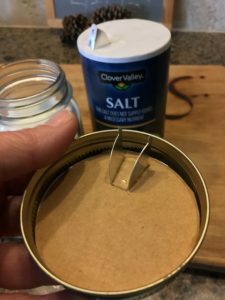 The jar is better than the cardboard boxes that salt comes in and pours easily from the pour spout. It’s definitely a ‘southern thing’. Here in The Great White North, if I tried this today (or, really, any day in the next couple of months yet) the water would freeze before it took on any tea flavour….. I actually did make this one summer day – guess what? Mr Shoes was so worried about ‘bacteria -“You let that sit outside in the heat & now you expect me to drink it? Forget it Lady” said Mr Shoes the fussbudget. Ehh, I drank it & lived to tell the tale. I am so pleased with your novel, money saving ideas that really work! if the sugar canister you invented was in a catalog, as a manufactured product, I am sure it would have many buyers for it! Oh, How Clever. That I never even thought of. Thank U I like making sun tea as well but sure didn’t have much for sun yesterday. It rained and it rained and rained some more yesterday. Indeed! I have to say I am happy that I found your blog. Thanks for sharing.